Exchange Server 2013 is a major new release and, as such, the Exchange product group invested in the key development areas that were projected to yield the largest benefits to both customers and the teams that run Exchange Online. A number of the product revisions centered on database and storage issues, many of which were needed to address problems in Exchange Server 2010, while others were added to deal with trends within the industry that Exchange 2013 would need during its 10-year life cycle. For example, the following issues existed in Exchange Server 2010 and needed to be resolved. As shown in Figure 1, magnetic disk areal density has been increasing dramatically. This directly affects how much capacity each drive platter can store and thus how much capacity a drive of each form factor can provide. Historically, areal density increased by 40 percent a year. In 2010, however, the IEEE suggested that this increase had slowed to 20 percent a year. Exchange Server 2010 had started to make better use of larger capacity disks. However, trying to use a spindle much larger than 2 TB JBOD was problematic because of Microsoft's recommendation not to exceed a 2 TB mailbox database and not to store multiple mailbox databases on a single spindle. During the life cycle of Exchange Server 2013, most storage vendors are predicting that they will be making 6 TB–8 TB 3.5″ 7.2K rpm disk drives. Ideally, this means that Exchange Server 2013 should be able to use an 8 TB 7.2K rpm spindle. Despite constant increases in areal density and storage capacity, the random IOPS performance for mechanical disk drives has remained fairly static. This is largely due to the physics involved in mechanical hard drive I/O performance. The obvious question is, why don't we use solid-state (SSD) technology, which can provide extremely high IOPS for each device? Not surprisingly, the answer is cost, as shown in Table 1. The prices in Table 1 show that solid-state drives are almost 15 times more expensive than mechanical hard disk drives when compared on a price-per-GB rating. Additionally, there are concerns about the longevity of solid-state memory for use with enterprise database workloads such as Exchange Server. There are storage solutions where a small number of high-speed SSD devices can be used as a form of secondary disk cache that provides higher performance without the high cost. In most cases, however, these solutions are extremely expensive when compared with an equal-size, directly attached storage solution. They may also result in unpredictable performance for random workloads. Given this difference in cost between SSD and mechanical hard disk drives, SSDs are not recommended for Exchange Server storage. This leaves design teams with a common problem, that is, how to calculate the random IOPS capability for a mechanical hard disk drive. As a matter of fact, there is a relatively simple method for deriving random IOPS per spindle given two commonly available metrics. Average Seek Time This is the average time for the disk head to reach its required position on the disk platter. Rotational Speed in rpm This is the speed at which the disk platters spin. Time for One Rotation This involves converting rpm into seconds per rotation in order to determine how long the platter takes to spin through 360°. Rotational Latency This value is the time that the platter takes to rotate through 180°. This is caused by the head moving to the track and then waiting for the right part of the platter to pass under it before it can read the data. On average, the platter will have to complete 180° of rotation before it can perform each I/O. Rotational Latency + Average Seek Time This value is the sum of rotational latency, which is the amount of time we must wait after the head has reached the right track before it can read the bit of data that we want, plus average seek time, which is the time we have to wait to position the head in the first place. The combination of the two values is the average delay before we can get the head to the right bit of the disk platter. Predicted Random IOPS This value is a theoretical prediction of the maximum random IOPS of which the spindle is capable. This formula calculates how many operations we can do per ms (1/Rotational Latency + Seek Time) and then converting that into operations per second (×1,000). Why is this important? We are mainly interested in this because the two factors that govern random disk IOPS for mechanical disk drives are rotation speed and seek time. Neither of these factors is likely to improve dramatically in the near future. Disks have been available at up to 15K rpm spindle speeds for the last five years or more. Nonetheless, these high-speed spindles are very costly, and they require more power and generate more heat (thus requiring additional cooling) than slower spindle speeds. It is also difficult to spin a large disk platter at such high speeds, and so most manufacturers only offer high spindle speed drives in smaller capacities, because they require a smaller platter diameter to maintain the high spindle speed. Minor improvements in average seek time have been achieved as manufacturing and engineering processes have matured. However, most storage vendors report that they do not expect to see any significant improvements in this area. This leaves Exchange design teams with a problem. 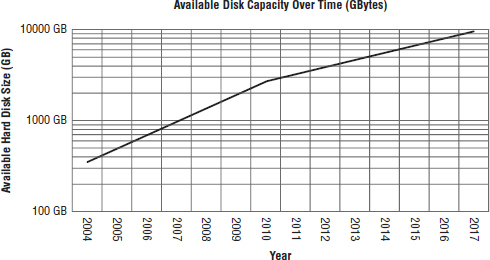 Disk capacities are increasing and costs per megabyte are declining, but random IOPS performance is relatively static. This means that we are unable to take advantage of these newer, high-capacity hard disk drives effectively. Thus, Exchange 2013 must be able to make better use of 7.2K rpm mechanical disk drives with greater than 2 TB capacities. Exchange 2010 allowed the use of JBOD. Though initially this term was confusing within the Exchange community, for our discussion the term JBOD will refer to the presentation of a single disk spindle to the operating system as an available volume. JBOD represents a very cheap and simple way to provide Exchange storage. Ideally the JBOD spindles will be slow, cheap disks and directly attached to each DAG node to provide the bestcost model. The JBOD model requires three or more copies of each database to ensure sufficient data availability in the event that a disk spindle fails. If the failed spindle was hosting the active copy of the database at the time of failure, there may be a minor interruption in service to the end user. However, typically the failover times are brief enough so that Outlook clients in cached mode will not notice this kind of failure. Dealing with disk spindle failures in a JBOD deployment can be largely automated via a combination of PowerShell scripts and monitoring software. However, it does require a level of operational maturity both to capture the alerts and to execute the correct remediation processes once the alert is received. Compared to a RAID based solution where a disk must be replaced, the level of involvement, resource skills, and access requirements necessary to repair a JBOD spindle failure is high. Exchange Server 2013 must provide an easier way to deal with JBOD disk spindle failures and to reduce the operational maturity and process required to recover from such failures. If there is one thing that is common to every release of Exchange Server, it is the expectation that the latest version will be able to support ever-larger mailbox sizes. In recent times, this expectation has also grown to include mailbox item counts. With Exchange Server 2010, the ability to store ever more data in the Exchange database via features such as In-Place Hold and single-item recovery meant that mailbox sizes increased dramatically. In-Place Hold is a mechanism whereby an administrator can retain all contents in a mailbox, even if the end user deletes them. This is extremely useful in scenarios such as litigation or where organizations need to persist end-user data for internal review. Many customers want to store all mailbox data within Exchange for both the real-time message service and compliance. Exchange Server 2013 must be able to maintain performance when clients are connected to these extremely large mailboxes. A common thread in Exchange projects is cost reduction. This encompasses not only the cost of the hardware but also running costs, datacenter costs, and network, power, cooling, and migration costs as well. As customer requirements have increased, Exchange has had to meet these needs and do so without spiraling costs upward. This is particularly evident with storage, where the requirements for capacity and performance have expanded dramatically while the demands for cost reduction have been equally dramatic. Recent trends have placed an increasing focus on power, heating, cooling, and datacenter space. Organizations are looking for new ways to reduce their operating costs. Exchange infrastructure can often contribute significantly in large deployments, especially when the storage and supporting functions are considered, such as backup, monitoring, publishing, and so on. Consolidation of roles was a common theme for Exchange 2010 projects, with many customers taking advantage of high-density locally attached storage, such as the HP MDS 600, which could provide 70 × 3.5″ SAS disks in 5U of rack space. Additionally, customers could take advantage of multi-role Exchange deployments to reduce the server footprint. This was a substantial improvement over previous versions of Exchange, and it allowed large-scale consolidation of servers and storage into fewer, more easily managed datacenters. However, power, cooling, and datacenter space costs are increasing. Exchange Server 2013 must continue this trend of consolidation while meeting the increasing business and operational demands for a robust enterprise-messaging product.